Bimota Forum :: View topic - YB7 rear sprocket? Posted: Tue Jun 19, 2018 5:32 am Post subject: YB7 rear sprocket? Do any of you guys know what bolt pattern or what rear sprocket will fit on the YB7? My thought was it was probably off an FZR400, I have no way of knowing. What a great little bike this is! I've got this spare. It's used, from Nigels YB7, so not in new condition. 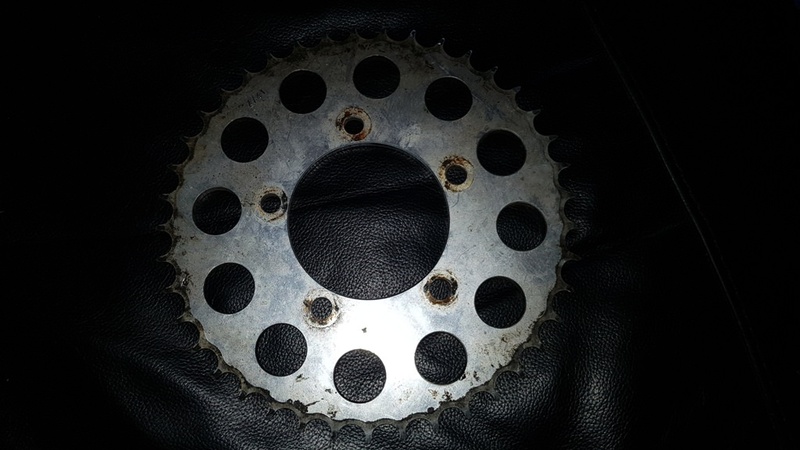 Could be a good idea to send it to a sprocket manufacturer to get one made (without having to remove yours) ? The sprockets are Z/41. They have a five hole bolt pattern. 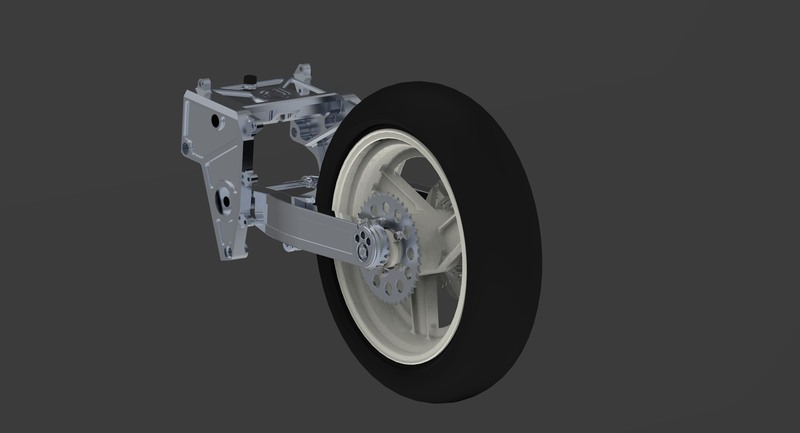 I'm actually in the process of 3D solid modelling my YB7. 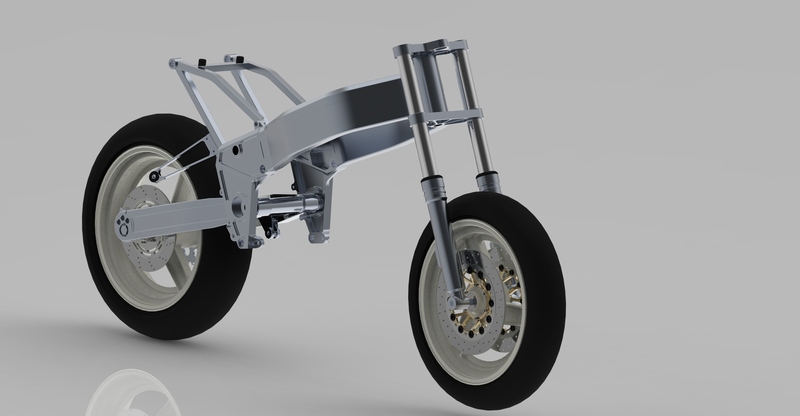 I’m trying to work out what size sprocket I need in your 3-D modeling your bike! 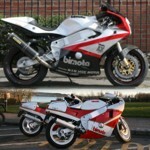 I’m knew the Bimota thing, I wanted a YB7 since I saw one in Padgets in Batley in 1987or 1988, I was 17. It had a velvet rope around it with a sign that said DO NOT TOUCH, which just made you want to touch even more. I picked mine up on Thursday last week, Delivered by Uship from Chicago to New York, the end of a very rewarding 30 year wait. 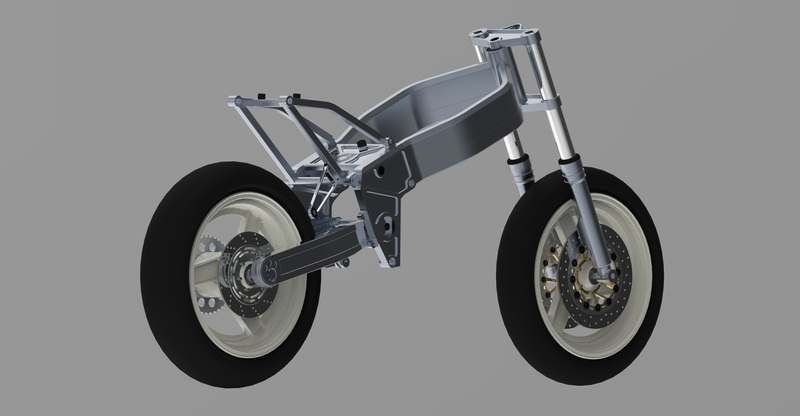 What are cracking little bike, and what a fantastic noise it makes! I’m totally hooked, the thing is awesome. I would like to go up two maybe three teeth on the back and give it a bit more lift in the first three gears, I don’t really care about top speed, this is a road bike and 100+ Is fast enough for me on back roads. Thank you all for the super useful replies, I really appreciate it. Any top tips for the bike? Thing gets mad hot in traffic, bit alarming but it stops at the red and comes down quickly, any suggestions on keeping it cooler? Brakes? Already it has Brembo cast iron full floaters up front which are up to todays standards if not beyond them.....not now fitted to most bikes due to cost...basic stainless steel discs being cheaper. Presumably it has the standard Yamaha black coffin pot master on the front brake?? ?...Some people upgrade that unit to Brembo gold series with remote reservoir or radial brembo units...all depends if you like the pull...find it too hard...or want lighter pull with same bite....How fresh are the brake lines/Brake fluid? If you have cooling problems, generally the best thing to do these days is to replace the radiator with a Chinkster one from eBay. Even if they are no bigger, a new radiator helps a lot. There are for and against opinions on Evans Waterless coolant. It has a higher boiling point, but it also significantly increases the running temperature of the engine which is not a good thing. Evidently the website doesnt highlight issues...and I get it has a higher boiling point so less prone to expansion and blowing the rad cap....but overheating the engine more? is that glycol retains heat better than water and thus higher temp fluid re-enters after exiting the rad keeping the engine less cooled/hotter than water does? How do you control when and how long the fan comes on for? these motors are designed to run hot! Yamaha recommend 50-50 water and a good quality glycol with "anti corrosion" inhibitors for aluminium engine. The red toyota stuff is sensational. 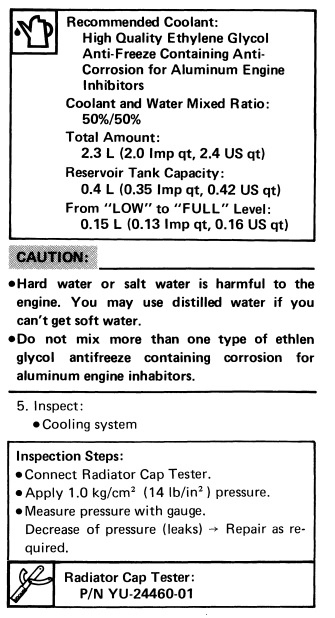 Never put tap water into your engine... of anysort. Distilled, or demineralised only. Buy it at the supermarket for next to nothing, same goes with batteries btw. There are products if you are road racing like water wetter, which help the cooling effect immensely, and are legal at least here in Australia. The fan switches on the larger FZ750 through to YZF1000 cut in at 107 degrees C. Make sure you don't have a dodgy 20 year old radiator cap on the bike? Check (when cold) that the rubber that seals the cap to the radiator neck is in good condition. Or just replace it anyway. Parts like these are consumables, including thermostats. Some people who are not comfortable with Yamaha spec temp settings wire in manual override switches for the fans, and switch them on at 80 or so degrees. The funny thing is the thermostat doesn't completely open until water temp reaches 95 degrees. Make sure all parts are in good shape, and trust Yamaha! Water under pressure boils at a much higher temp. Yamaha knows best! do NOT in any circumstances use "waterless coolants" sure fire recipe for having over heating / head gasket issues and potential for far worse ........you may as well save your hard earned and fill the system with concentrated a/freeze at a 1/10th of the price if you were so inclined / in general terms it doesn't dissipate the heat correctly and so doesn't act as a "coolant"
Hi Stockcar, I agree with most of what you say, but when it comes to Yamaha...You must obey...lol.